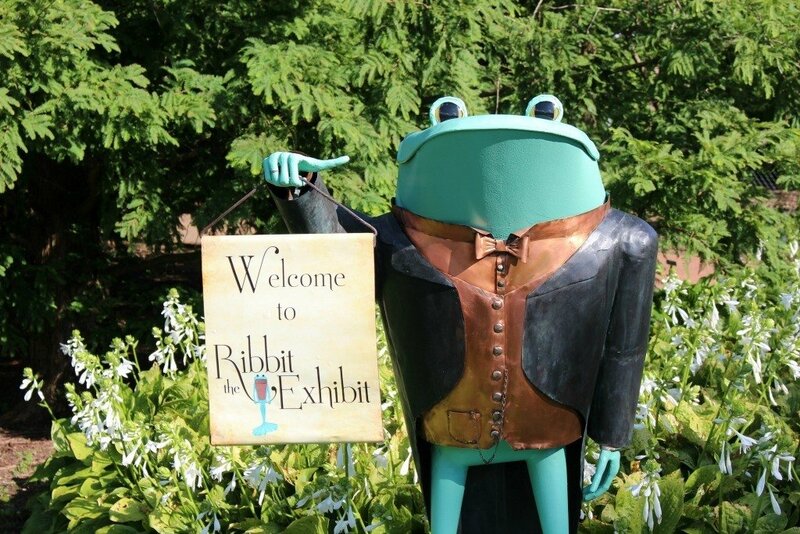 Ribbit the Exhibit can be seen at Kingwood Center now until October 1st. 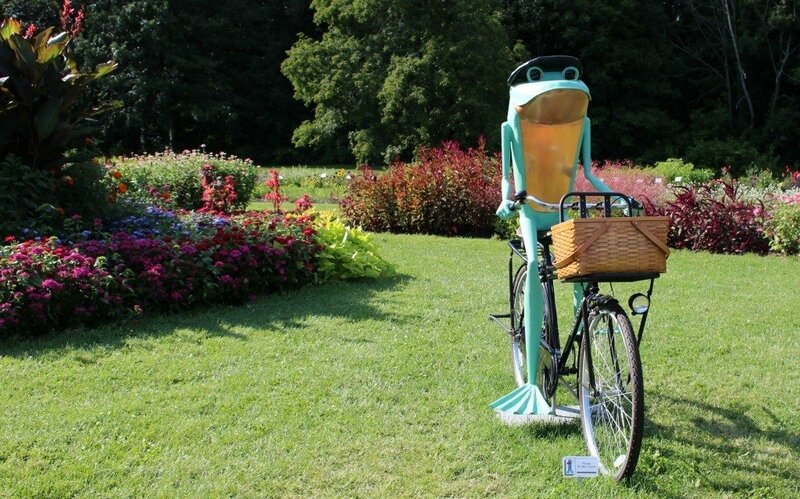 This traveling exhibit has been featured in the Atlanta Botanical Garden and contains a collection of whimsical four to six-foot-tall frog sculptures that are displayed throughout the garden. 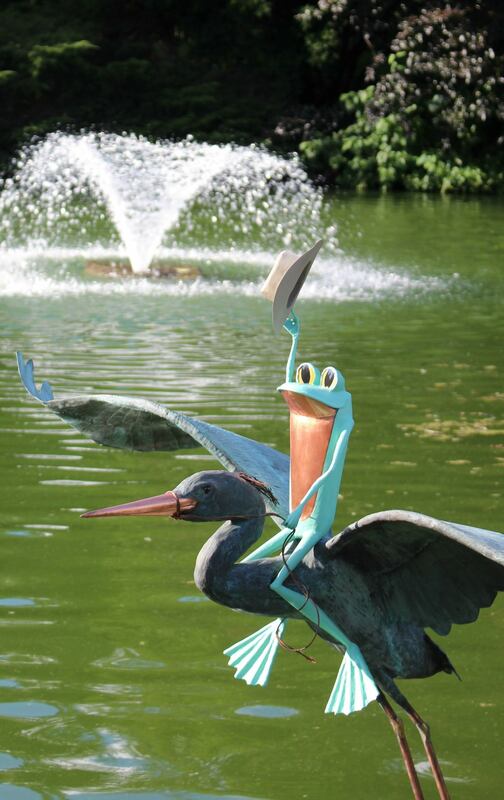 Kingwood Center has always been one of my favorite attractions in my hometown of Mansfield but when I heard that a collection of frogs had hopped into town, I couldn’t get there fast enough. I knew this would be one collection that I would love. And I was not disappointed. From the frog that welcomed us as we entered the parking lot on top of the ticket booth, to the meditating frog in the greenhouse, to the frog mowing the grass on the lawn, I felt like a little kid on a treasure hunt as each garden path lead my husband and I to another sculpture. 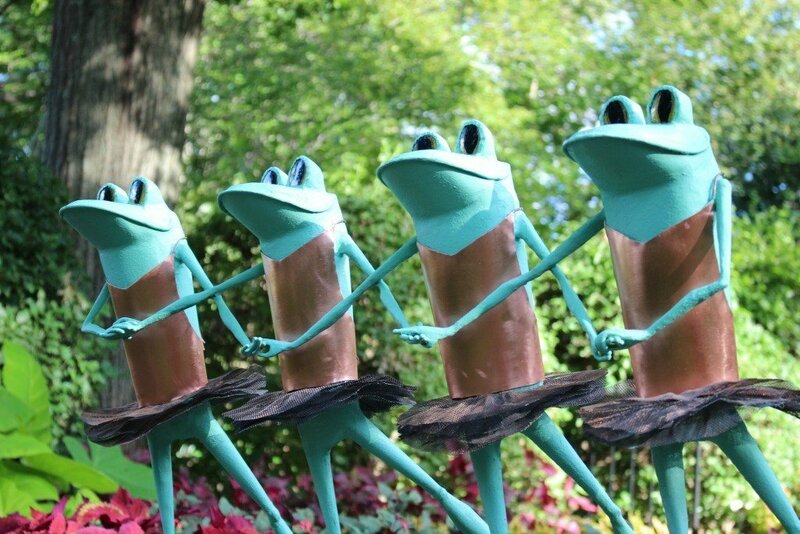 At Kingwood Center, you’ll find a trio of frogs called the Ribbittsville Ramblers dressed in bib overalls armed with a washboard and banjo’s near the duck pond while across the gardens, you’ll find a pair of frogs gracefully dancing in the historic formal gardens. Who Created Ribbit the Exhibit? The copper sculptures are the work of J.A. 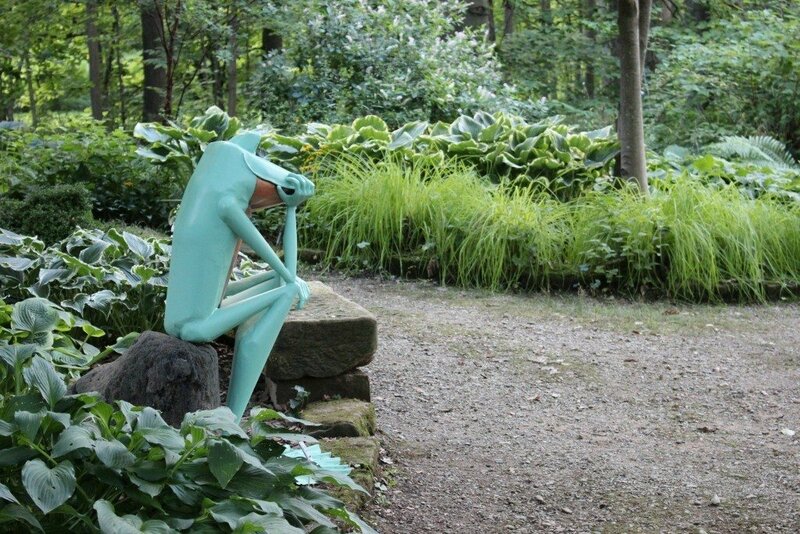 Cobb, a North Carolina artist, who makes a living putting smiles on people’s faces by creating whimsical large-scale frog sculptures. Cobb patterned his first frog after Old Toad from the Wind in the Willows complete with a vest, morning coat and brass oil lamp. Andy first draws each sculpture then cuts it from sheets of copper. The copper sheets are hammered and folded into shape, much like someone folds origami. Next, the pieces are assembled around a steel armature with a brazing process of solid copper. Finally, a chemically forced patina is applied using heat to finish the piece which will last for generations. 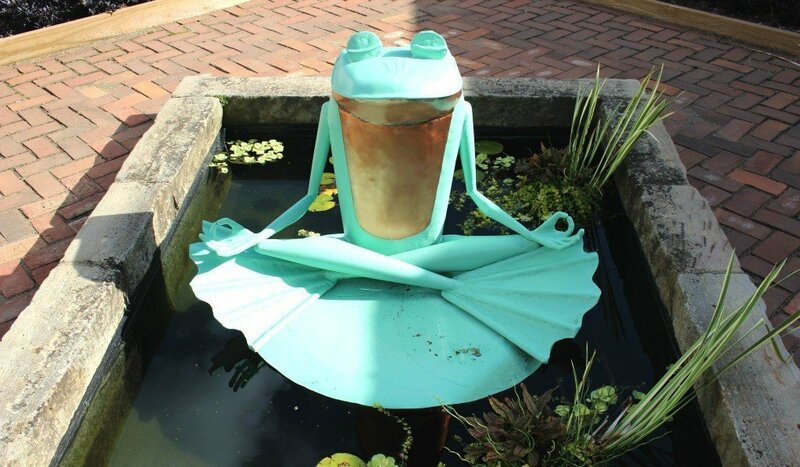 Though Andy creates fish and birds too, he’s known as the “Frog Man” due to the hundreds of sculptures he’s created of these cute reptiles in various poses for clients, public and private, around the country. At the time of my visit there was no map or brochure available for more information which I thought was a little disappointing because I didn’t want to miss a single sculpture. 1. Download the Kingwood Center Gardens App before you arrive. The app is designed to enhance your visit by providing you more information about the gardens including the history, horticultural practices, and fun facts while keeping you up to date with upcoming events, etc. 2. Pay attention to hours of operation before arriving. 3. Wear comfortable walking shoes. 4. Visit during the evening if possible for cooler temperatures and better lighting for photos- though if you want to take a self-guided tour of Kingwood Hall, you’ll need to be mindful of their daytime hours. 5. Plan to spend a minimum of one hour to explore the gardens- allow more time if you plan to feed the ducks, visit the greenhouse and tour the home. 6. Pack a lunch or snack to enjoy on the lawn or at one of the tables located on the property. 7. Take a few quarters for feed for the ducks (though keep in mind, if Kingwood Center has had a lot of visitors, they may not be hungry). 8. Keep an eye open for the resident peacocks and peahens. 9. Consider purchasing a membership to help support Kingwood Center. Admission: $5 per person, children under 6 are free. 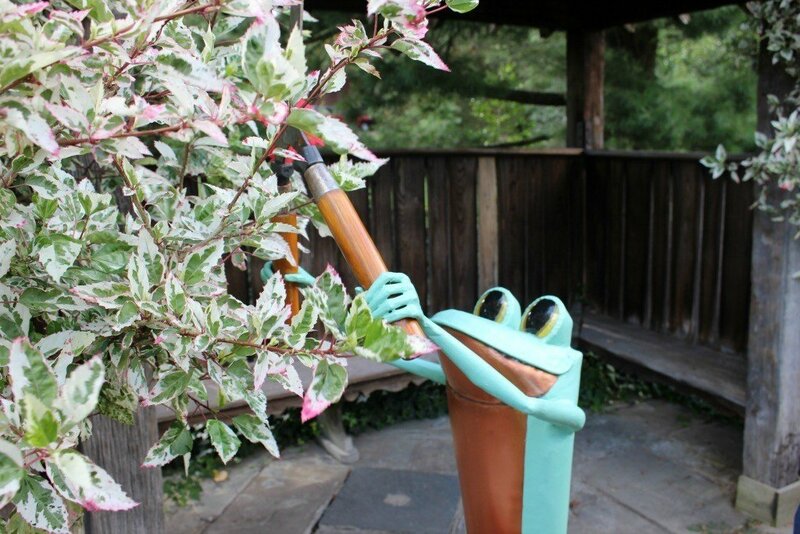 Have you been to Kingwood Center to see Ribbit the Exhibit? Is this an exhibit you would like to see? Looking for more things to do in Mansfield? That looks like SO much fun! 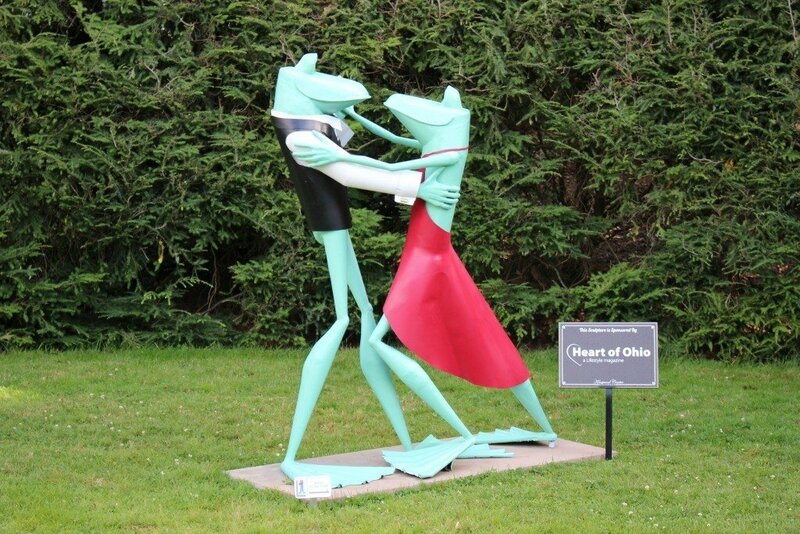 I love whimsical art, and would truly enjoy the Ribbit the Exhibit! I love the one riding the bike! I think that’s probably a little of what I look like on a bike! I will have to take the kids there- I think they would love it. Thanks for sharing.